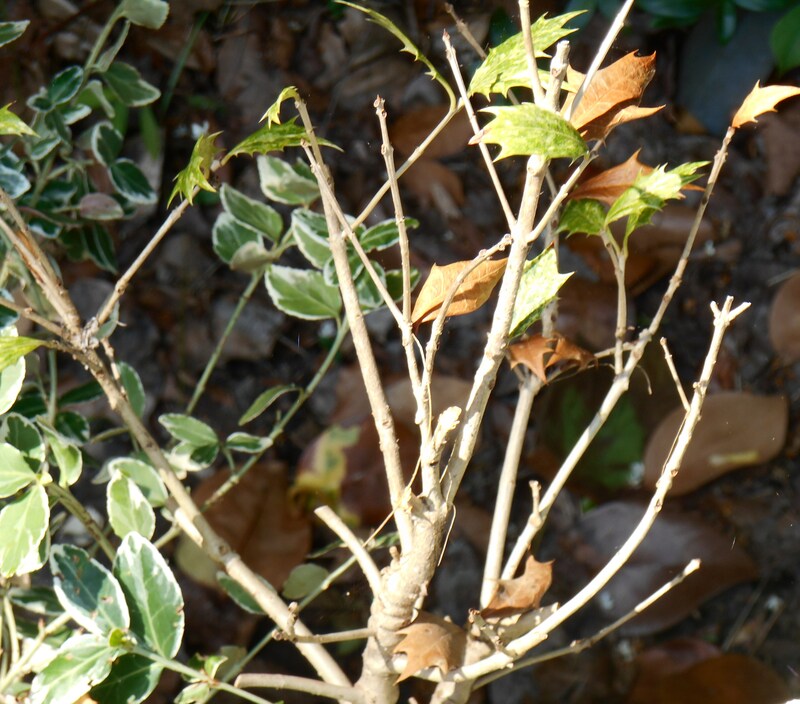 Our unusually intense winter made a devastating impact on several plants in the garden. The amount of snow and ice the garden endured, and the longer period of freezing cold weather before winter finally melted into spring made this a record breaking winter in Williamsburg. Although we are technically in Zone 7b (average low temperatures of 5-10 F) , many winters, especially in recent years, have been far milder. 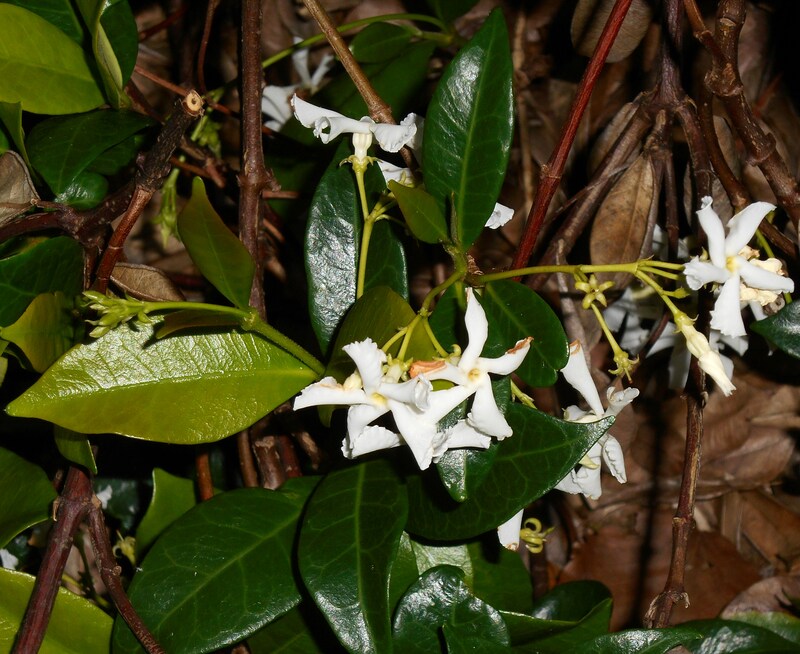 Plants rated for hardiness in Zones 8-10, like our Star Jasmine, Trachelospermum jasminoides, have made it through recent winters just fine. Normally evergreen, with thick, glossy dark green leaves, our Star Jasmine has been an important feature of this garden for decades. Planted in brick planter box beside the railing and fence which enclose our side entrance, this vigorous vine grew to completely cover the metal structure long before we came to the garden. Its tough woody stems have twined themselves into oneness with their support. We find the vine beautiful. We enjoy it year round, but especially in winter when it is still green and leafy. We also enjoy many weeks of its white blooms perfuming the air each summer. This vine is a vigorous grower and will expand its reach each year if not frequently pruned. And so when its leaves began turning brown and dropping in February we were concerned, but hoped the vine would survive the season. 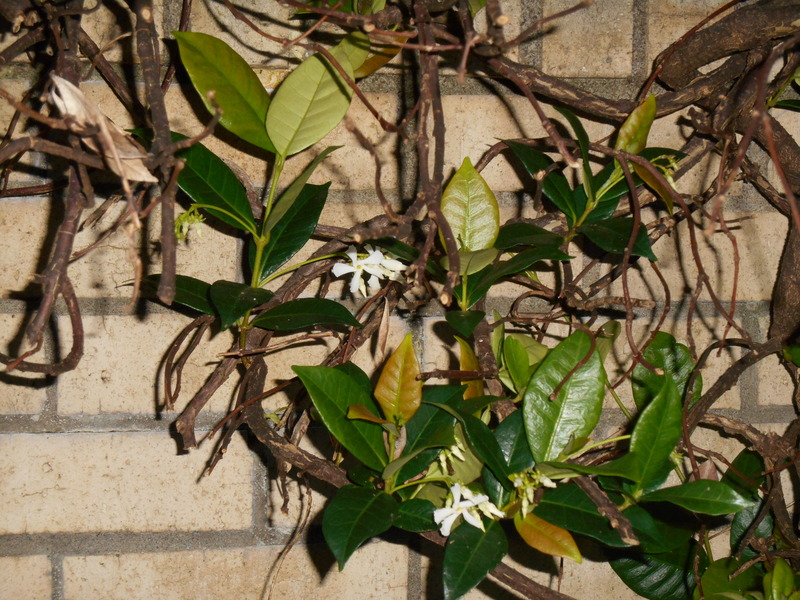 As winter turned to spring, more and more of the vine turned brown so that our once healthy green living wall of Jasmine by the side entrance shriveled into an unsightly mass of bare vines. I’ve avoided showing you photos of our poor Jasmine vine. It has been such a depressing sight. We both had confidence in its strength and eventual recovery. 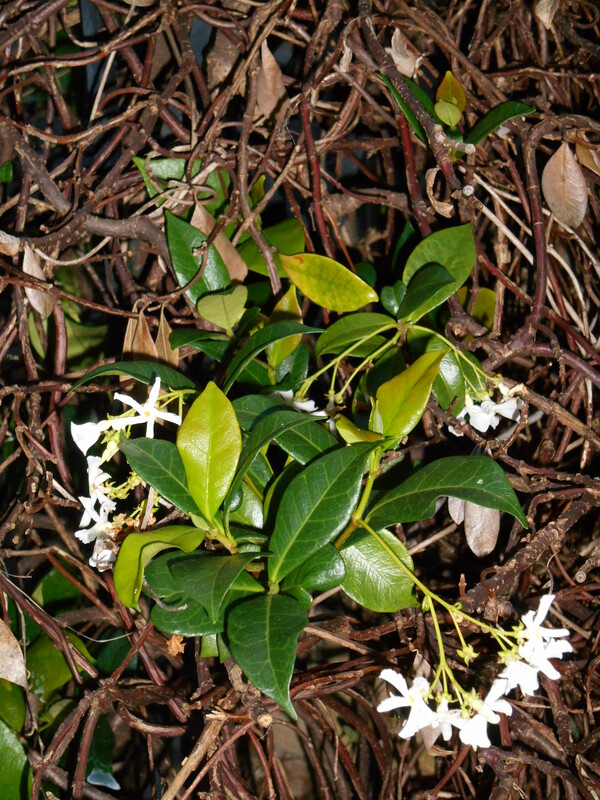 Soon after we recycled the pots of our seemingly dead Bay trees, and after we gave up on several Rosemary and Lavender plants, we finally agreed the time had come to prune the Jasmine vine hard in hopes of shocking it into growth. A few remaining green leaves here and there were testament to a bit of life still in the vine, but these were few and far between. So in late April we both had a hand in the great pruning. We took almost half of the vine, trimming back to where the structural woody branches were clearly visible. I poured Neptune’s Harvest over the roots, and have included the planter box in all of my outdoor watering this spring. And the vine is slowly recovering. 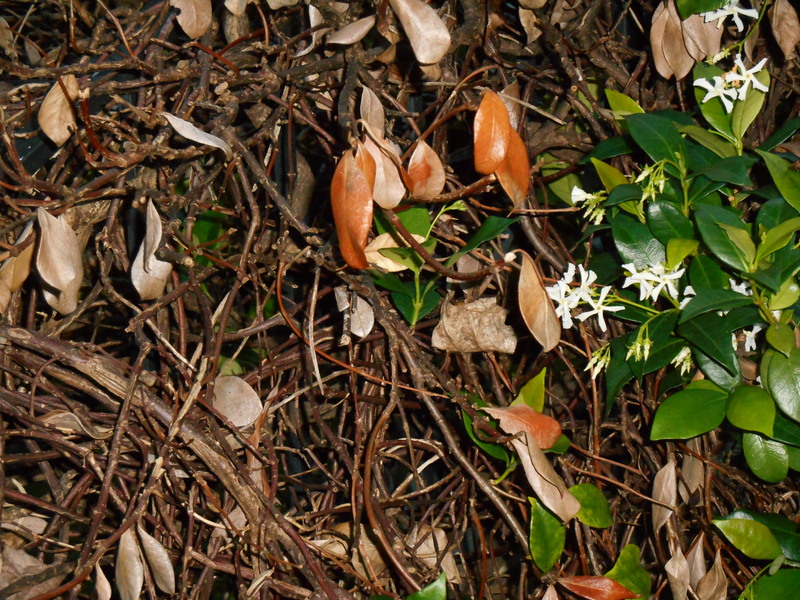 From a distance our Star Jasmine remains a mass of brown, with patches of green around the edges. But up close, new leaves and fragrant flowers are visible all over the vine now. After a hard winter, sometimes you just have to wait for plants to respond to spring on their own time. Osmanthus Goshiki lived happily in a pot on the deck until this winter. Since it still has some leaves alive, we hope it will soon sprout new growth. An Osmanthus goshiki shrub has lived in a pot on the deck for three previous winters, but has only a handful of green leaves at the moment. We moved the pot to a shady recovery area and I we keep checking for evidence of new growth. So far, we’re still waiting. 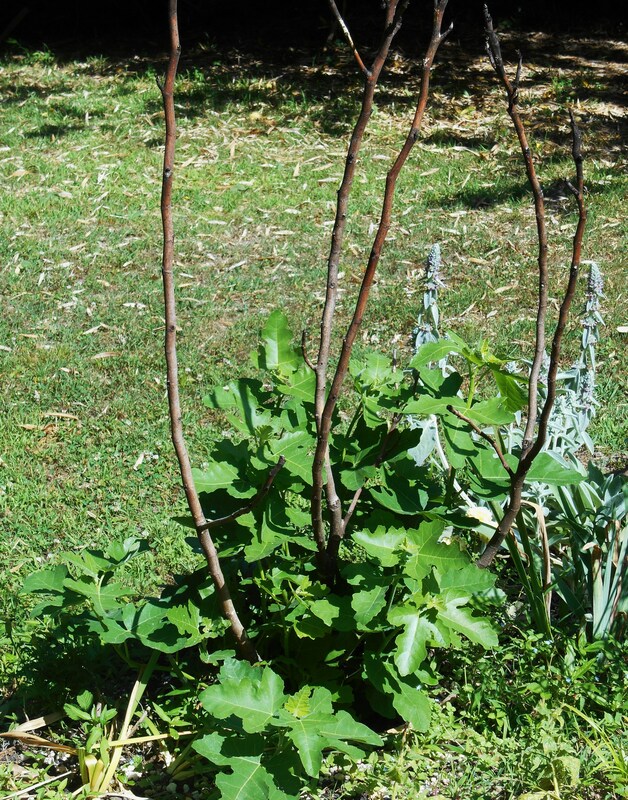 A new fig shrub has growth coming from the roots, but none has broken out of its woody structure, yet. 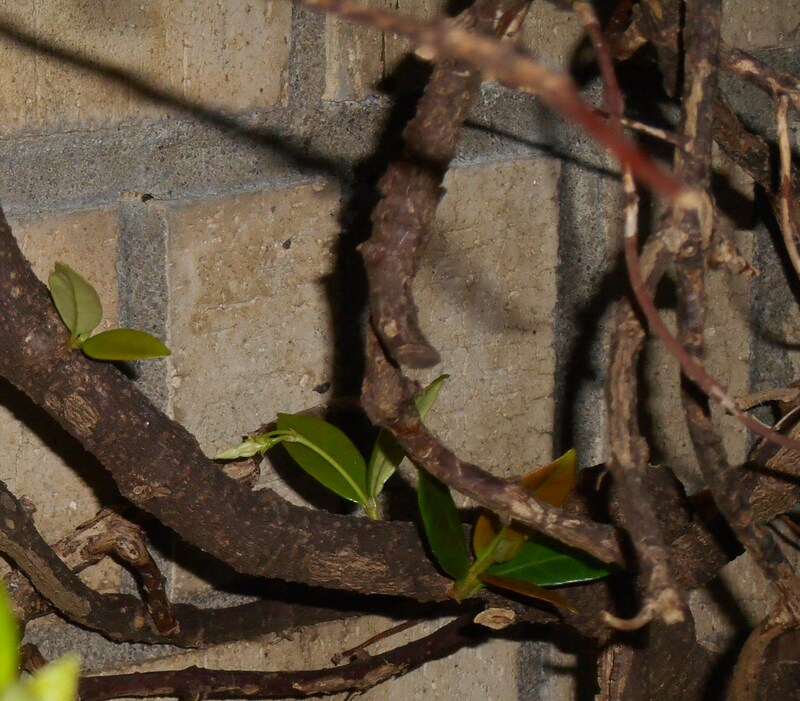 This little fig, moved from a container to the garden in autumn of 2012, trippled in size last summer. So far new growth is visible only from its roots. I haven’t pruned off the old wood, waiting to see whether it responds to our warm May before giving up. So from a distance the shrub looks like a casualty of winter. Nature has its own rhythms and patterns of hot and cold, light and dark, moisture and drought. We observe and respond, sometimes an ambivalent dance partner with nature taking the lead in this ever unfolding dance of life. 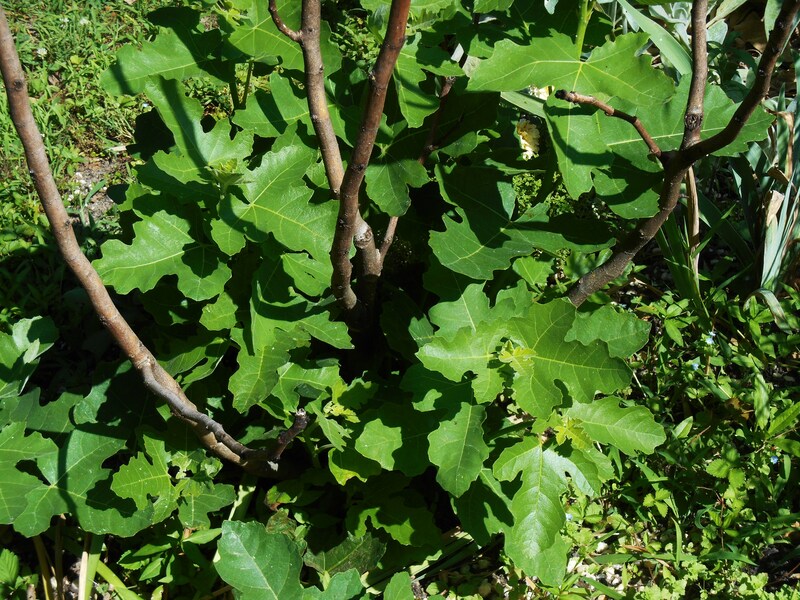 A more established fig, elsewhere in the garden, finally shows new growth from its branches. 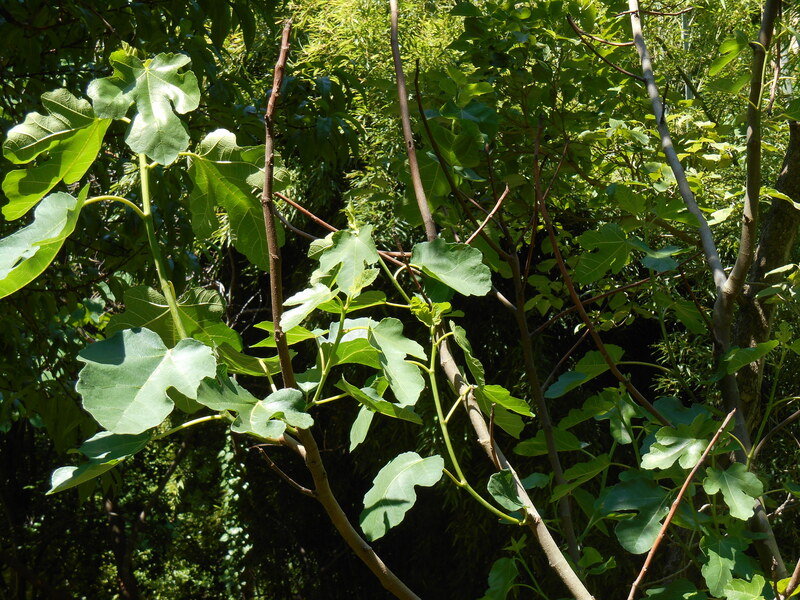 I’ll continue to wait a few more weeks for our newly established fig to sprout new growth before pruning it back. Often patience is our best ally. And we are often rewarded with beauty when we are willing to simply …. wait for it…..